Informations about "sandisk micro sdhc card 64gb class 10"
Having searched the market for the cheapest buy prices, 52 offers were found for comparison. Furthermore, a large number of offers in 6 relevant categories with a price range from £5.69 to £189.99 were found. 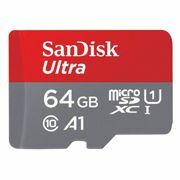 About "sandisk micro sdhc card 64gb class 10"
Overall, our search showed 12 different e-shops for your product "sandisk micro sdhc card 64gb class 10", including Picstop.co.uk, 7dayshop.com, shop4world.com and 365games.co.uk. The most offers (5) were found in the price range from £16.00 to £16.99. Furthermore, other users were also interested in the following product: Micro SD Card 32GB Class 10.